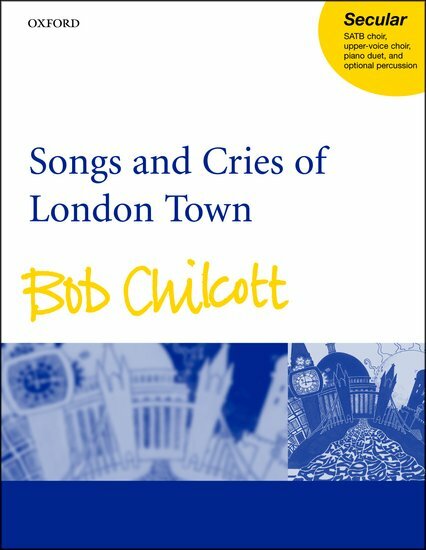 Songs And Cries Of London by Bob Chilcott is a vibrant and varied choral cantata in five movements for SATB choir, upper-voice choir, piano duet, and optional percussion. The two outer movements draw their words and inspiration from "The Cries Of London" by Orlando Gibbons and frame three contrasting middle movements setting a poem each by Dunbar and wordsworth, as well as the anonymous 18th century rhyme "Oranges and Lemons." Together, these settings evoke a surprisingly contemporary impression of London's sights, sounds, and moods, inspiring some irresistible music, by turns contemplative and unquenchably thrilling.